On Jen's lunch break we got together and did some work on her droid. We taped LC's skins on and found the center of the legs holes. 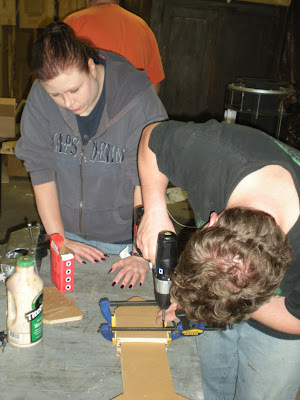 Once the centers were located Jen drilled the holes for the pipes to fit into. The legs are now part of the frame. R3-PD is almost standing! Jen's droid is slowly getting there. We only have one and a half nights left to try and get her droid standing for FCBD. I stopped home just now and brought her frame inside because the temperature is dropping and the dew point is climbing. With the skins off everything looks good. I set the frame on a level table and filled exposed joints with glue on the bottom side. Here is a picture of her droid as it stands. Still need to drill the leg holes, weld up the center leg bar, level and drill the leg mount bolts, put the main eye on while finding a temporary way to keep the dome top from slipping off, put in the sound system, and stand the whole thing up on it's legs. Jen and I made a switch box for R3 that is similar to my R4's. First I cut some plastic to width. 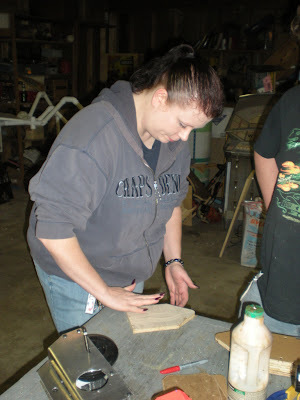 Then I heated it up in a break and bent it into shape. On the back side we put a strip of wood in for reinforcement with some counter sunk screws. After that Jen had to get home so Brad helped me trim her lower dome ring for R3 with a simple jig. Finally after weeks of getting side tracked on other projects, Jen and I glued up her frame. Starting with a pile of parts we slowly put the pieces together. Once together we wrapped LC's skins around it and strapped it together. One rib was being a pain and not staying in so Jen put a clamp on it. Once the frame was done Jen did some clean up on the legs and drilled the pivot holes for the feet and installed the bushings. With the legs done for now and the frame drying she is looking forward to putting the two together. Had a little down time before dinner so I worked on making Jen and me skirts for our Astro Droids. First I cut the circles on the band saw using my jig. Then pre-drilled the inside corners of the inner leg hole. Taking the time to cut straight, I used a jig saw to cut out the lines. A little fine sanding and this piece is ready for future assembly. Wired up the motor holders this evening so I could test them out. I crimped on the connectors and put electrical tape on them. Tucking the wires inside the legs to clean up the look a little I decided to do the same to Patches motor holders as well. Drilling a hole in the frame to pass the wires through I wired them up and tried them out on a battery manually. Today I finally got Ed's motor mounts 98% done. I put the motors, belts, wheels, and tension rails in. 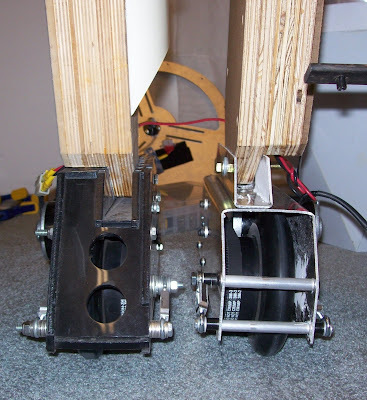 The only thing left to do is drill a through hole for the motor wires and a support bracket for the foot shells. Here is a comparison of our custom design (on right) next to Patches version (on left). Once I got mine done I helped Brad finish his up for Lumpy. Just 4 more sets to help finish for the rest of the local group on Tuesday and we should be done. Stopped by home just now and put another coat of paint on the rear skin. Starting to look like an R2 part LOL. This moring I took the tape off the signatures and all looks good. It still needs a day or two to cure all the way though. I then took the time before heading out to work to file all the tabs on the rear skin and door parts. Then I sanded the sharp edges smooth so the paint does not chip on the edges later. The red dots are for where I will counter sink the holes for the screws that hold the skins on. Later in the evening I JB welded the biggest back door panel together. It takes forever to clean up the extra JB weld that squeezes out when you clamp the halves together. Next I counter sunk the holes for the screws and filed the burs off on the back side. After cleaning up all the aluminum dust with mineral spirits I primed the back skin. Three coats with 20 minutes between coats. Around 4pm I put two coats of white spray paint on the skin and left it to dry. I will put another coat on in the morning before heading to work. Dash came over for a bit and we finished putting his motor mounts together. Drilling for the rivets first while trying not to kill each other with the drill. LOL Then putting the pop rivets in that hold the omni bracket in. We then put all the bushings in and the motors then installed them on Dash's R2-DR frame. Then, after adjusting the height of the center leg and tightening up the muffler clamps on the legs R2-DR is standing on his own with a very happy Dash at his side. Once that was done we had a little time to work on my motor mounts as well. I will finish them up this weekend when we finish Brad's I hope. With the weather finally warm I am preping to do some gluing and painting of the rear side of R2-CM. I went threw my piles of skin parts and got all the pieces for the rear doors. I will need to file them tomorrow evening before gluing them up. I took the one panel that has the autographs and sprayed three thin coast of clear coat on them to help protect the signatures. All went well so far. I centered the rear outer door piece on the back skin and traced an inner and outer line around the edges. I then removed the door and traced a line between the other two lines, that will be the cut line. Taking the skin to the garage, Denny assisted in helping me cut the lines as straight as possible on the band saw. Also while I had the back skin off I countersunk the screw holes from before that I could not reach with the legs in the way. Jen did a bit more glue up on her R3 legs with LC's and my help.